Greg Valerio and I, representing Reflective Images Jewelry and Fair Jewelry Action, attended the meeting. 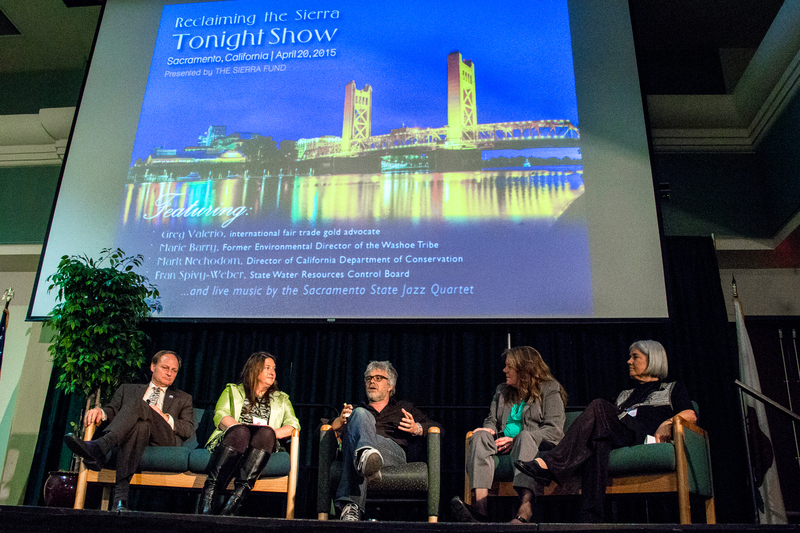 Greg, at center, was the keynote speaker for the most recent event in April, 2015. There are small ponds scattered throughout and we have no idea what toxins are in that water. Gold from this river built the economy of the "golden state" for decades, but there's no money to know what toxins, if any, are in these ponds. But this is just a small issue in context to what is going on here. The Department of Conservation in California estimates there are 47,084 abandoned mines, and of these 5,200 present environmental hazards. The The Sierra Fund, which has been working on legacy gold mine issues in the Sierras, estimates that there are about 19 million tons of mercury in the watersheds of San Francisco, Los Angeles, San Diego and the central valley. What can a jeweler do about such a massive problem? Enter the Sierra Fund (not to be confused with the Sierra Club). Greg Valerio and I have been in collaboration with this group over past few years, mainly on a consulting basis. This started a few years ago. Kerry Morse, a staff member, initially contacted me to ask whether jewelers could be interested in gold that came out of the tailings. We had a long conversation walking through a wooded trail in the mountains east of my home in Santa Fe. This initial meeting led to a round table multi-sector meeting in Berkeley where we discussed a plan for an interested mining company to remove mercury from mine tailings and restore riparian areas. There were scientists, tribal representatives and environmental organizations, including Earthworks. Also attending was a mining company with a very strong environmental record. We toured sites where there was prototype machinery that could remove the gold and mercury using a method that would not involve chemicals. There is more than enough gold left just in the tailings to making this kind of project appealing. The gold sales would support a restoriation of the riparian area around the river. An additional premium on this “eco-gold”, marketed by pioneer ethical jewelers, would fund the efforts of the First Nations indegenous groups, whose genocide from the 49ers is well documented, to restore the salmon fishery. Izzy Martin, the ED of The Sierra Fund, is driving this effort. She is a remarkable visionary and environmentalist, working collaboratively with scientists, regulators, the government and First Nations leaders. She’s now being recognized for her efforts with the 2016 James Irvine Foundation Leadership Award. The efforts of the Sierra Fund are even more critical with the current drought. This award draws attention to the critical need of protecting the Sierra Nevada region, as it is the source of 60 percent of California’s water.The good news is that we have the technical know-how in order to solve this problem. But, of course, it will take time, resources and political will. The Sierra Fund project is one of the most comprehensively hopeful projects I’m currently involved in. It addresses both environmental and social impacts of legacy gold mines. It is also a model of mining which is regenerative—that actually benefits the environment and community. What is particularly exciting is working with that gold. In a Sierra Fund conference in the spring of 2015, we offered to create a collection of California gold artisan wedding rings and ethical unique jewelry from this momentous gold.